In the Northern Gulf of Alaska, multidisciplinary researchers have performed oceanographic observations at established station locations for more than 45 years. The history of these measurements breaks down into four time periods. Recent – since 2017, when the Seward Line joined the LTER network. Primarily, these observations have been made offshore of Resurrection Bay, the fjord that connects Seward, Alaska, to the Northern Pacific. At the mouth of the bay, at Station GAK1, temperature and salinity (hydrographic) observations began in 1970. These have been conducted approximately monthly since. After a few years, sampling began along a 150 nautical mile long transect that we call the Seward Line, with 17 cruises from 1974 to 1997 and semi-annual cruises thereafter. This transect stretches from GAK1 into oceanic waters well past the continental shelf break, and data from it has been critical in defining the oceanic current systems that characterize the system. 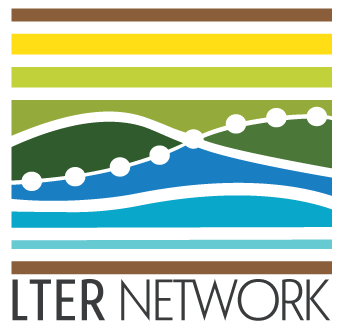 Over the years, a variety of agencies, organizations, and programs have funded observations in the NGA LTER area. These uninterrupted datasets will fill temporal gaps between the research cruises, and will help us understand of variability at sub-seasonal timescales. After GLOBEC ended, NPRB supported cruises in May and September, in which sampling was reduced to the core Seward Line stations (2005–2010). During 2011 and 2013, the NPRB-funded Integrated Ecosystem Research Project (GOAIERP) allowed expanded along-shelf coverage during spring, summer and fall, and explicitly linked oceanographic conditions and plankton communities with early life history stages of commercially important demersal fish species. By 2012, a consortium of NPRB, AOOS, and EVOS had expanded the program to include Prince William Sound and consistent seabird/mammal observations. Core historical time-series from the above sampling efforts include measurements of temperature and salinity, macronutrients, chlorophyll, and zooplankton. Starting in 1997, sampling in the NGA area expanded to include chemistry and biology during 6-7 cruises per year as part of the U.S. Global Ocean Ecosystem Dynamics (GLOBEC) program. Jointly funded by NSF and NOAA, GLOBEC was a multi-year, multi-disciplinary program. It examined the effects of climate change on ocean ecosystems, specifically on important fisheries. All together, these studies established biological seasonal cycles and rate processes for the region. UAF oceanography professor Dr. Thomas C. Royer established the Seward Line and GAK1 in December, 1970, soon after ship operations for the Institute of Marine Science (IMS, CFOS, UAF) moved to the Seward Marine Center. 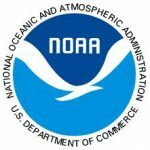 At the time, there were no fall or winter hydrographic profiles for the Gulf of Alaska continental shelf in the National Oceanographic Data Center (NODC) database. 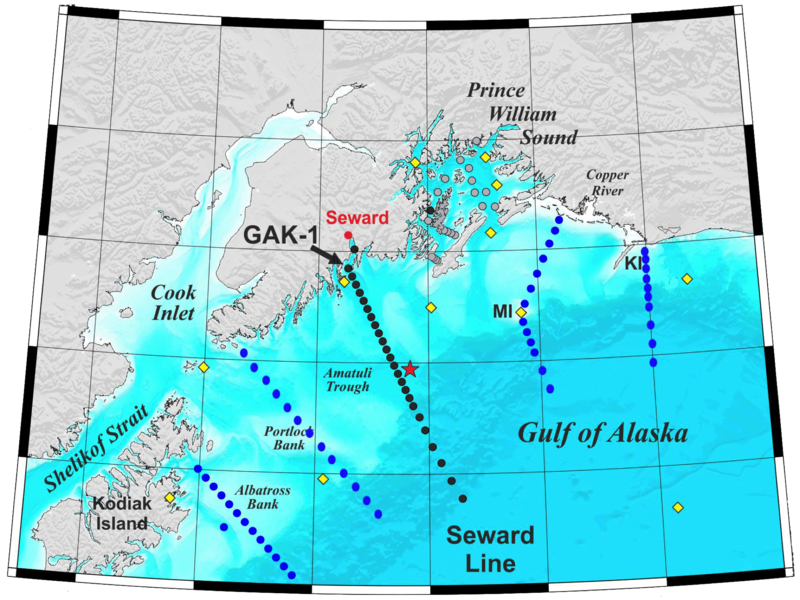 Dr. Royer led >20 Seward Line physics research expeditions and innumerable day trips to GAK1 from Seward. In the early years (pre-1974), the hydrographic data were bottle samples only since the CTD didn’t work well. The Seward Line was laid out with a sampling station interval of 10 nm – the ship traveled at 10 kts, and it took an hour to read thermometers, draw water samples, and prepare for the next station. Dr. Royer’s last Gulf of Alaska sampling cruise was in April 2003 (another in April, 2004, was aborted because a problem with the ship, the R/V Alpha Helix). Other historical data sets relevant to the NGA include NOAA’s ichthyoplankton surveys (annual from 1977–2011; biennial thereafter) and groundfish surveys (triennial from 1980–1999; biennial thereafter). This work is partially supported by the National Science Foundation under Cooperative Agreement #OCE-1656070, October 2017 – September 2022. The University of Alaska Fairbanks is a part of the University of Alaska system.